We started off our time in Hurstville doing a bit of “getting to know you” with our new host family. The next day we were run around and got to tour some of Sydney, followed by our largest Rotary meeting yet. There were four clubs all gathered for a single meeting… somewhere over 100 people were present. It also happened to be, in my mind, our best presentation to date. We really fed off the energy of the crowd and they laughed when we hoped they would laugh and stayed in rapt silence when we hoped they’d be retaining information. The next day we visited Symbia Zoo, which is a cross between a petting zoo and a standard zoo. 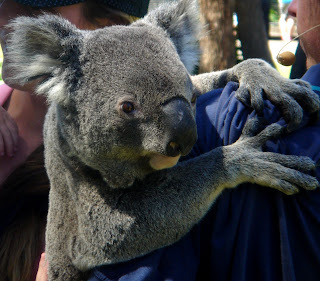 At this zoo we got to not only feed kangaroos, wallabies, emus and other animals, but we even got to pet a Koala. Most of the time we were there the Koalas slept, as they are apt to do, but when they were awake they seemed docile. 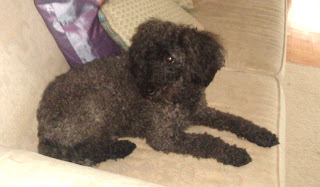 However, we were careful around them as we were warned that they can get aggressive, especially if they feel provoked. In addition to the Koala we got to see the Tasmanian Devil. They look nothing like the cartoon character. There is currently an illness that is quickly devastating the natural Tasmanian Devil population on Tasmania, it is forcing conservationists to try and create a breeding population in other areas in case the population becomes too thin to guarantee the survival for the species. It is the same reason the zoo is trying to collect funds to build an add-on to their current set up that would add two Sumatran Tigers, in the hopes of starting a breeding group. According to the information they gave us there are only about 250 Sumatran tigers left worldwide. After our time with the animals we spent more time driving around Sydney allowing us some spectacular views of the Sydney Opera House and the Sydney Harbor Bridge. These two structures epitomize the skyline of Sydney more than any two other structures. 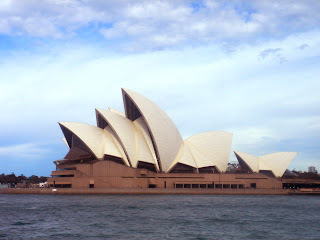 I can never look at the Sydney Opera house without being reminded of my mother. When I was young she often mentioned that it was one of her favorite buildings and that she loved the elegance of it. At the time I think she was secretly hoping I would go into architecture rather than writing. I finally got some sunburn, on my left elbow where I apparently missed with my spray, and on the tops of my feet where the sand and water obviously wore down the sun block to the point where it could no longer do its job. But the burns aren’t bad, thanks to some heavy cloud cover giving me the assist. We also had a dinner tonight that allowed us to meet some new people, including one of the team members for the Australian team that will be coming to Connecticut. Tomorrow is a vocational day and I’ll be flittering around the publishing industry here and then going to a Cancer Lodge (a medical in-house treatment center specializing in Cancer treatment and research). Hopefully I’ll have some new and interesting information to paste here this weekend. In the rare bouts of free time that I’ve had I’ve also been working on retooling “The Song of Ending” for the upcoming Ever War short story anthology. I expected my visit here to inspire a different story, but the fact that it inspired me to revisit and rework a different story first is a testament to the transitional effect this trip is having on me. 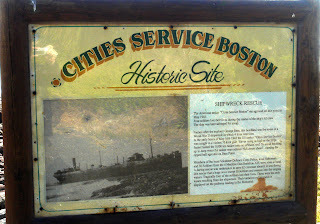 On Saturday morning I got to see the marker for the “Cities Service Boston.” It was an American ship that had crashed on the rocks in the Kiama/Shell Harbour area and four Australian soldiers perished in the rescue mission, but none of the people on the ship died as a result of the crash and the heroic efforts of the Australian rescuers. For the weekend we had a few free days. I completed roaming around Kiama while some of the others went on to various Vineyards for some wine tastings. While going around Kiama I saw the Terraces, which are small shops that are sort of like a strip mall with porches. 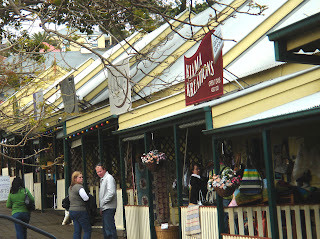 They were originally housing for the miners that lived in Kiama, but since then they had been converted to shops. They were set to be torn down for a short time, but they were declared a historical landmark and were saved from destruction. With a free day on Sunday I went with another team members to Woolongong while some of the others went hiking or refreshed themselves at the beach. Woolongong had a recent event of sadness wherein a sailing ship crashed and sadly there were some casualties. 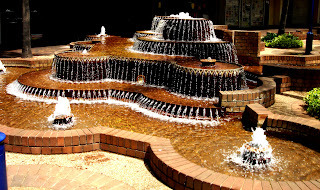 In the shopping area near the brewery and stadium there were some lovely fountains. On the way back to Kiama from Woolongong the train ride was calm and most of the route was scenic and beautiful. 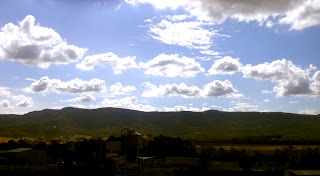 Today we go to see our new host families as we move to St George and the suburbs of Sydney. 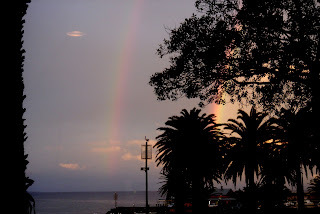 Time has a funny way of running out on you when you least expect it, and as such my time in Kiama is coming to an end. While preparing to head to St George I'm also preparing for the possibility that it may be quite a while before I have access to wireless internet. Hopefully it won't be long at all and I can continue to keep everyone updated with what's going on with the trip. Yesterday we started off at TripleCare. For lack of a more appropriate term it is a rehabilitation center, but more accurately it is a center that helps young people who have had issues with substance abuse or other destructive problems go and learn to overcome those issues and find the inner strength that's hidden within. They can then take that knowledge, coupled with the marketable skills they are taught at the center, to build on, as a foundation to a better life. 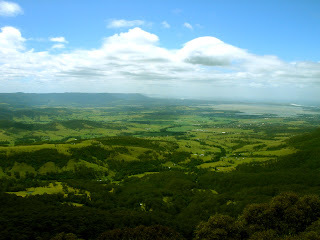 Below is a view from the location, which is both serene and breathtaking. 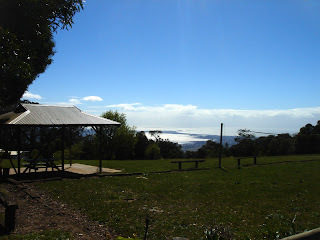 After Triplecare we trekked to the Flywalk at Illawarra. 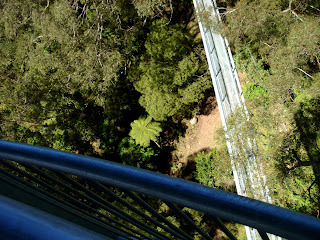 It is roughly a giant walkway suspended over the trees on a mountain. 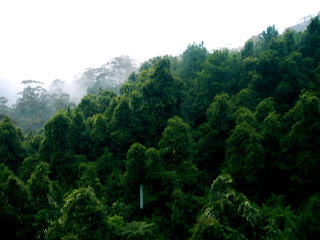 The entire walkway is about 1.5 kilometers in length and very very very very very very tall in height. The first image is a shot from the top of the Knight's Tower pointed at the ground. The second shot is the view of Kiama from the top of the tower. 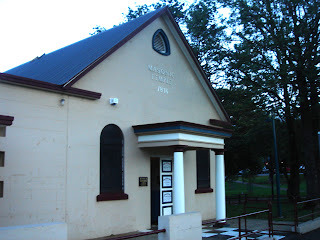 That evening I was a welcomed guest at Kiama Lodge. The lodge is older than the Commonwealth of Australia and I was happy to find that fellowship is the same around the world. The brothers made me feel welcome, and watching their ritual was certainly a learning experience. Today we visited a woman affiliated with WIRE, a group that does wildlife rescue work in Australia. They help animals injured in car accidents and left on the side of the road, or animals that are the offspring of a parent killed by a car. I have attached two photos from this visit. 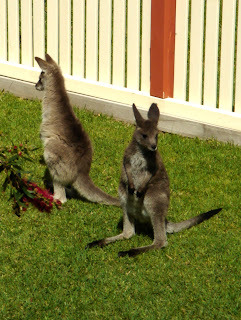 The first is a pair of Kangaroos that were rescued, both of which were extremely young. 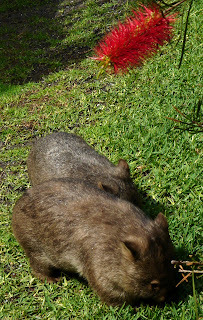 The latter is a pair of Wombats. It was interesting to learn that they have giant bone plates on their rump and shoulders to protect them in case heavier animals collapse their Burroughs and step on them. Also, their pouch is backwards to a Kangaroo or a Koala's pouch so that they don't spread dirt into their pouch with their offspring when they dig through the dirt. 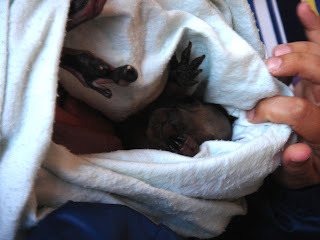 I also wanted to mention, that before our group left the animals we got to see a baby wallaby and two baby kangaroos. Whereas the other two Kangaroos where young they didn't quite match the big-eyed cuteness of the baby roos. They had their fidgety moments, but for the most part they just wanted to curl up in their blankets and be adored. We tried not to disappoint. Dual rainbow action! Kiama welcomed us with open arms, and the weather has managed to split the rain and clouds at times for fierce sunshine and open skies. While walking with Pepsi we got to see some of the beach front views of Kiama including the beach below, which the surfer's called "Mystic Beach." You can only get to the beach by trekking through the woods or swimming. There are no cars. It's not very populated. Since Sandra claimed a beach a few Kilometers away as her own, Alan and I decided to claim this as Alan and Dan's beach. While it's true that I'm not much of a beach person due to the lack of shade and volume of water the seclusion of this spot fits my needs for relaxation... plus with the trees so close I can hide in the shade and just watch the waves. It was walking in this area of Kiama that we got to see humpback whales playing in the water not far off. 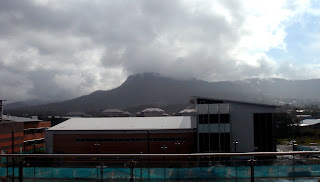 We spent most of yesterday at the University of Woolongong. It's a beautiful campus, but also very young with its eyes set firmly on its future rather than its past. It is in the process of developing a medical health center and has a technology center that incorporates visionary technology with entrepaneurial ambition. While the collection of tech buildings make heavy use of green technology we found out some interesting things, like the fact that they are limiting the use of solar panels because in those same buildings they are working on the next generation of solar panels which will be cheaper and more efficient (and easier to produce). This is the view from the main building at the tech center where you can see why there is no short supply of inspiration for big ideas. The rain continues to plague the East Coast and vacillates between non-existent and torrential downpour. I suppose we're lucky that this week it's not coming with the giant red dust clouds that festered upon the area just two weeks ago. 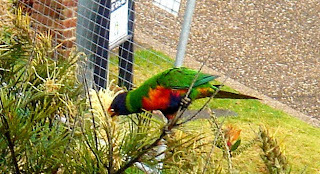 Outside the home where I'm staying there are a group of birds called "laurelkeets" (that's more of a phonetic spelling and might not be completely accurate) that inhabit the trees. Despite their vivid colors they manage to blend in very well with the greenery. 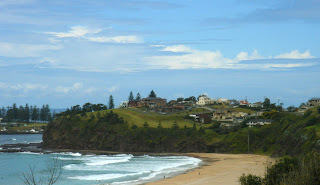 Much of Kiama is beach-front property. Unlike back home, here the beaches are all open to the public. You do not need to pay the government for the right to access any beach. I believe this is a federal law. As we got to meet and mingle with the members of the Kiama Rotary Club we learned that one of their members passed away in recent years and the last project he worked on has become a memorial park in his honor. I have attached a video of the park and the area most directly improved and worked upon by Rotary members. 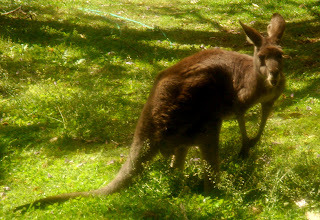 We finally got to see our first live kangaroo on Thursday. She was small for a Kangaroo and she was 18 years old. She was a rescue. We went to see a farm that rescued animals and raised birds and had a variety of fruit trees (down to 300 trees due to a recent fire, but previously over 1,000). We also got to see a couple collections while visiting the farm. Afterwards we went on a bit of a historical lesson as we saw how people in Woolendilly lived at the end of the 18th century and later including a lesson on the local aboriginal culture. Friday was another day of running around and jam packed with learning. 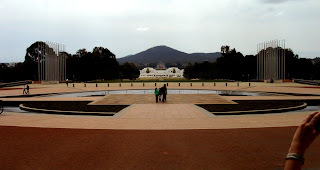 We travelled all around the capital including parliament, the US Embassy, and the Australian War Memorial. 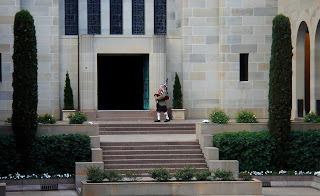 Below is a picture of the Lone Piper playing "Flowers of the Forest" as is customary for Australian Military funerals. People familiar with The Dropkick Murphey's rendition of Green Fields of France will be familiar with this custom. Saturday was a trip to the Blue Mountains. Unfortunately for us there was quite a bit of rain and fog (a good thing for the area, though, which is in need of rain). A couple times the mist and the fog cleared so I could get some good shots. The three sisters, located in the fog to the right in the picture below, were unfortunately not visible during our visit. However, we did get to do some exploring in the nearby rain forest and we got to take the steepest railcar in the world, which drops at 52 degrees. 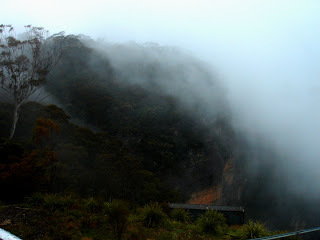 Below is the first video I shot of our stop at the Blue Mountains. It details the fogginess and stands as proof of my indeterrable ability to bring rain with me whenever I travel.